Mario Balotelli says he had no hesitation in deciding to move from Manchester City to AC Milan because it had been a long-term ambition. The Italy striker is having a medical before a to the seven-time European champions for an initial fee of 22m euros (£19m). "I'd wanted to play for Milan for such a long time," said the 22-year-old. "Obviously I played for other teams and couldn't come. But when there was the chance, I ran." City signed Balotelli from Inter Milan for £24m in 2010 and he scored 30 goals in 80 appearances for the club. He helped City to the Premier League title last season, but has managed only three strikes in 20 matches this time round. "I didn't have a good start to the season with City and I hope to do well here at Milan," said the Palermo-born forward. Balotelli flew to Milan by private jet on Wednesday afternoon with the Italian club's vice-president Adriano Galliani. Galliani said: "With his arrival, we have reinforced our team a lot. He's a dream come true, wanted by the [AC Milan president Silvio] Berlusconi and the club. "Mario has been in our hearts for many years and finally we've managed to get him." Milan reached an agreement with City on Tuesday and Balotelli will sign a four-and-a-half-year contract, subject to passing his medical. 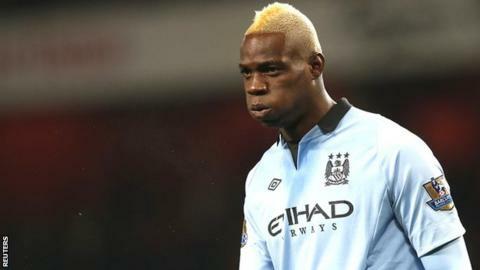 Balotelli's departure follows a on 3 January - the latest in a series of controversies in his time at City.